EXIM INDIA’s BHP 2012, the definitive international conference and exposition on break bulk, heavy lift, project forwarding and hazardous and liquid cargo, had a grand opening at the Bombay Convention and Exhibition Centre on Thursday (March 29) in Mumbai. The response to the event, which comprised a two-day conference (March 29-30) and three-day expo (March 29-31), was remarkable, to put it mildly, from panelists, delegates, exhibitors, event partners and supporters. With its niche focus and adhering to the theme ‘Break Bulk, Heavy Lift & Project Transportation: Developments, Changing Trends and Future Outlook’, the conference attracted, as speakers and panelists, nearly 50 of the top sectoral head honchos from India and abroad, be it port and terminal heads, directors/senior managers of top logistics and freight forwarding firms, shipping line representatives, logistics heads of manufacturing/ infrastructure/energy companies, ship managers, and consultants. And complementing them were some of the leading policymakers and regulatory authorities. Added attractions, as part of the conference, were the , focused on the handling of hazardous materials and liquid bulk cargo, and a workshop on the ‘basic essentials of heavy lift and project cargo shipping’ conducted by SAL Heavy Lift GmbH. In short, while the technical sessions of the conference facilitated comprehensive deliberations on the entire gamut of issues pertaining to the sectors, where the positives were highlighted, the shortcomings listed and suggestions put forth; what enhanced the panel discussions were the notable interventions by a knowledgeable audience made up of industry players. There was general consensus on the lack of infrastructure being the main impediment, the initiatives taken by private players, be in ports or forwarders or shipping lines, were appreciated. It was also suggested not to wait for the government to give impetus to the sector (though the right policies and regulation were deemed a must), but to begin to make a change at one’s own level. Increasing water-borne traffic in and out of a port was considered to be the need of the hour. As with all the previous Exim India events, BHP 2012 Lucky Draw too saw top prizes attract enthusiastic participation from the large number of delegates/visitors. 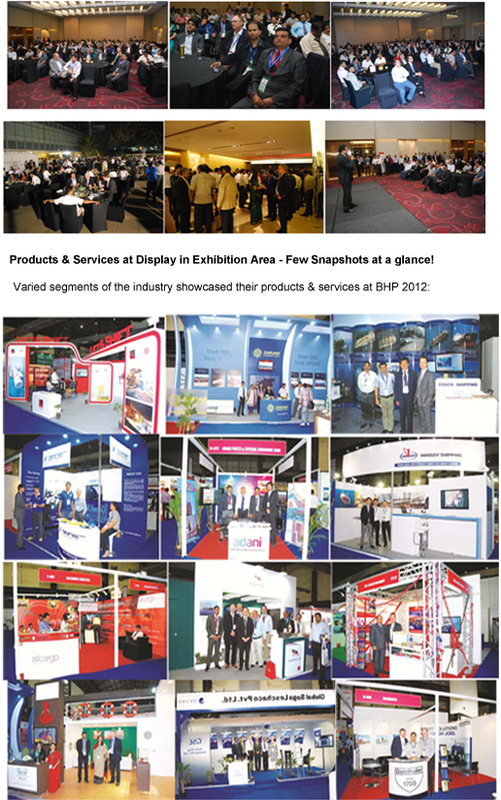 BHP 2012 thus had it all – a stimulating and invigorating conference programme, an international exposition which saw close to 100 exhibitors profiling their products and services to numerous trade visitors who learnt about the best of services and products on display at the exposition. 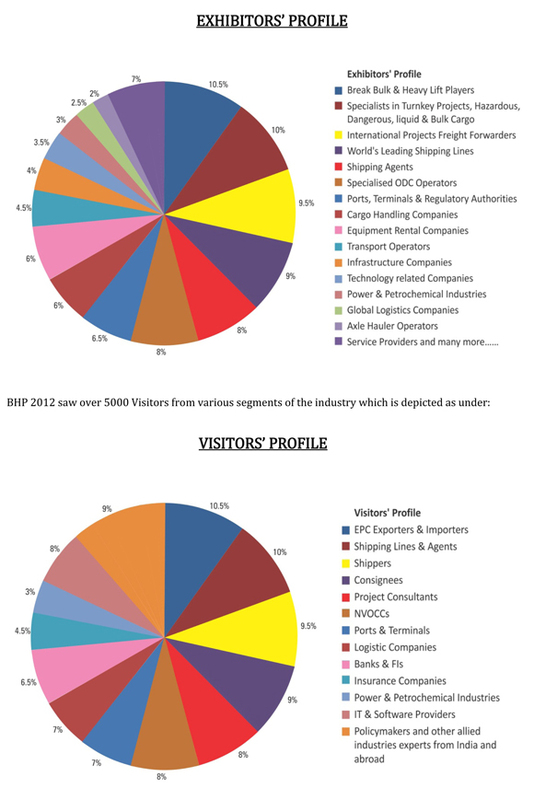 From many an event partner and numerous trade organisations, both Indian and international, having extended their official support, BHP 2012 is building up to be a grand event to discuss, display, learn, advocate, chart the way forward, and network. BHP 2012 thus had it all — a stimulating and invigorating conference programme, exhibitors showcasing their products and services from their brightly-designed stalls, top speakers and panelists, enthusiastic delegate participation over the three days, interactive format, networking opportunities with sectoral peers and a chance to meet policymakers and regulators. The three mantras players need to follow are efficiency, timeliness of delivery and cost-competitiveness. A food for thought and action was the general opinion. Networking Cocktails & Dinner at The Westin Mumbai Garden City – A Five Star Luxury property on Day 1 was enjoyed by the trade at large. Over 500 delegates had a good networking time at Westin. The event not only witnessed great networking opportunities but also many fruitful business deals were generated. In true sense BHP 2012 emerged as a “Global event” according to delegates. Trade Reviews for BHP 2012 ! Just a small note to Congratulate you and the EXIM Team for the successful event. Sai Maritime & Management P. Ltd. I wish to thank-you very much indeed for having given to me the chance to participate to such an interesting and challenging Event. I wish to express my warmest congratulations for the high quality of the event, very punctually - good organization and last but not least, to the particularly friendly and warm atmosphere you all succeeded to give to this event. Please accept my sincere congratulations on an extremely well planned and well thought out event at the BHP 2012 Exhibition. It is indeed commendable that you are showcasing our industry in such a good light and making all out efforts to make this a truly global event which can put India on the radar screen even more to the International trade and which also gives us a good chance to interact locally with our fraternity on a common platform. It was a wonderful informative conference sharing lot of information about the current stage of break bulk & project cargo handling.